While we were having a great time staying at the Bayview Wildwood Resort, we also got to indulge our Maple side with some visits to amazing places! On Saturday we packed up and went to Wye Marsh located on Highway 12 East in Midland Ontario for the 24th annual Sweetwater Harvest Festival. When we got there, we were happy to see that there were shuttles from the parking lot to the entrance. 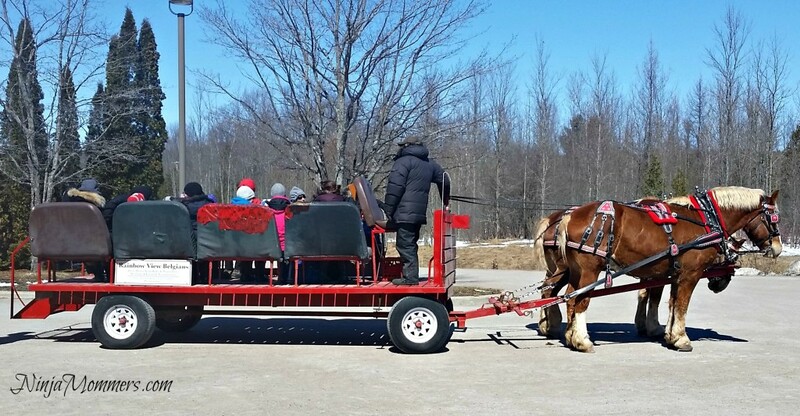 The kids were ecstatic to learn that two of those shuttles consisted of horse drawn wagons! The horses were beautiful! There were so many incredible things to do and see at the Sweetwater Harvest Festival. We were all so excited that we just couldn’t wait to get started. Outside the front entrance and Inside the Wye Marsh visitor center, there were all kinds of vendors selling some great looking things, ranging from food items to handmade wood crafted items! We just had to buy a few suckers, a Maple Shortbread cookie, and of course a big, lovely, bottle of Maple Syrup. Mmmmm. You could also see reptiles inside, which was super cool. The kids were in LOVE with the turtles and little man even petted a snake. Baby girl made a “HECK NO” face and contently watched from the sidelines. There were some very friendly people cooking some tasty looking pancakes on the way out of the visitor’s center! We were still full from breakfast so we didn’t stop for any, but next time we will save room! 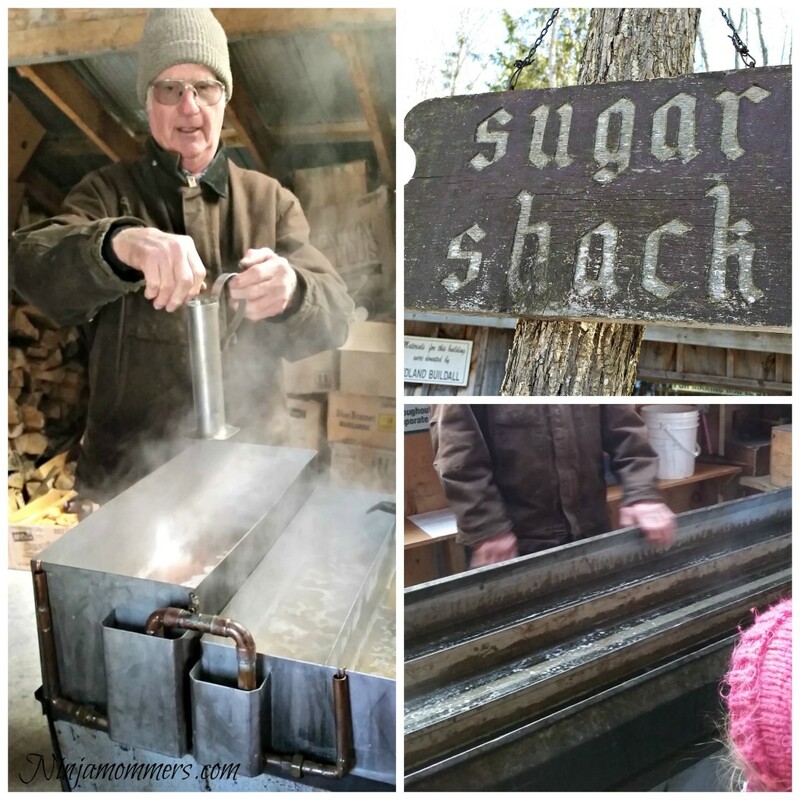 The family and I went and checked out the Sugar Shack, and found out some of the History of Maple syrup and how it was made way back when. The gentleman giving the tour was so informative and funny! It was really cool to see the evaporator and how it worked. Of course, the kid’s favourite part was the Maple Taffy tasting. Who doesn’t love Maple taffy! We lined up and waited as the excellent volunteers poured maple syrup over the snow! SO delicious. The kids couldn’t get enough! Yes there are sugar shack tours, pancakes and taffy tasting, but there is so much more to the weekend long festival. There are birds of prey and reptile/amphibian talks; wilderness survival, cooking and woodcarving demos; and of course chickadee feeding. The kids had such a great time, and hubby and I did too. We can’t wait to go back next year! 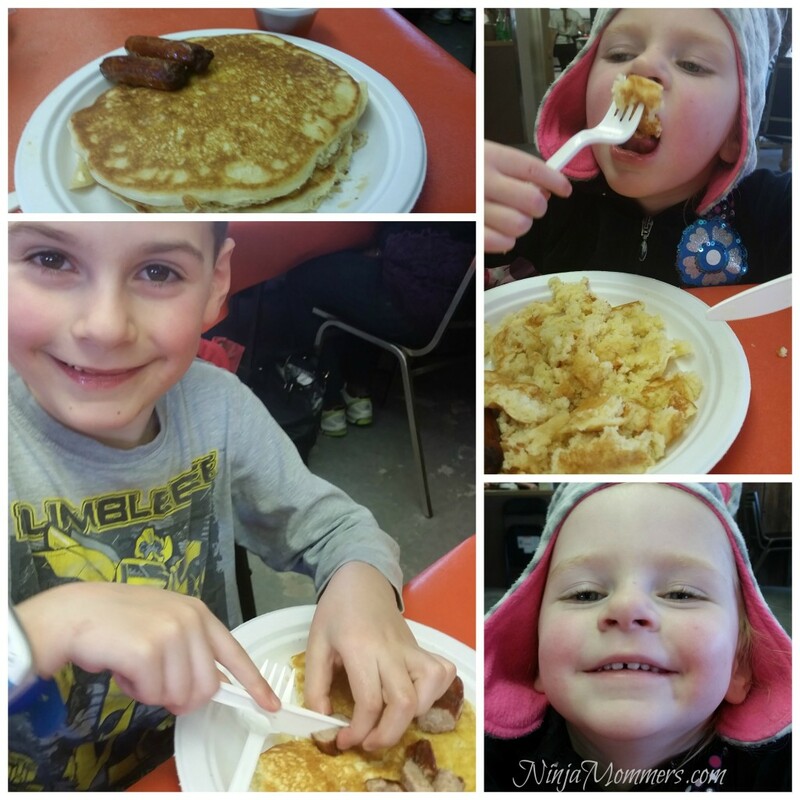 On Sunday we made our way to Oro-Medonte to visit Shaw’s Pancake house and maple syrup bush! As we waited in line, we got to watch Maple syrup being made and bottled! It was really cool. The kids loved it. Once we were seated by the friendly staff, the kids couldn’t wait to get their pancakes, and once they arrived at our table, we were not disappointed! These Pancakes were so light and fluffy! Since we were there to celebrate Maple, we made sure to drown those pancakes in delicious maple syrup. DELICIOUS. We also had an amazing breakfast sausage on the side, I, naturally dipped those little loves into that amazing maple syrup too. Yes I did. Just thinking about it, I want to go back now. Once we were done with our pancakes, we headed in to the little store, where we made sure that we purchased some awesome maple products. We got this amazing maple BBQ Sauce that I use on everything now. EVERYTHING. Of course, the kids got some maple candy, I let them have some, but trust me, I was tempted to eat all on them. After our Pancake and Sausage we went on a horse drawn wagon ride through the Maple syrup bush, it was so cool seeing all the trees tapped and connected to the lines. I couldn’t get over how large the maple syrup bush was! The kids loved it! Watching as everything went by and asking millions of questions. We are going to go back soon, and take some friends with us to enjoy it! Shaw’s Pancake house and Maple syrup bush was so great, that we just HAVE to share this find with all our friends. 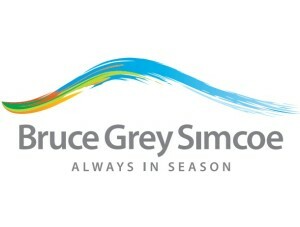 Visit The Shaw’s Website for More Information about hours, and how you can Tap Into Maple with Shaw’s! 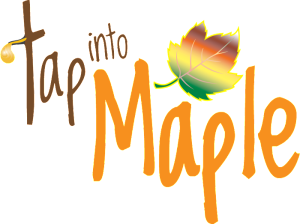 For more information on how you can Tap Into Maple Check out the awesome Websites below or Follow on Social Media and Tap into Maple this Spring with your family. 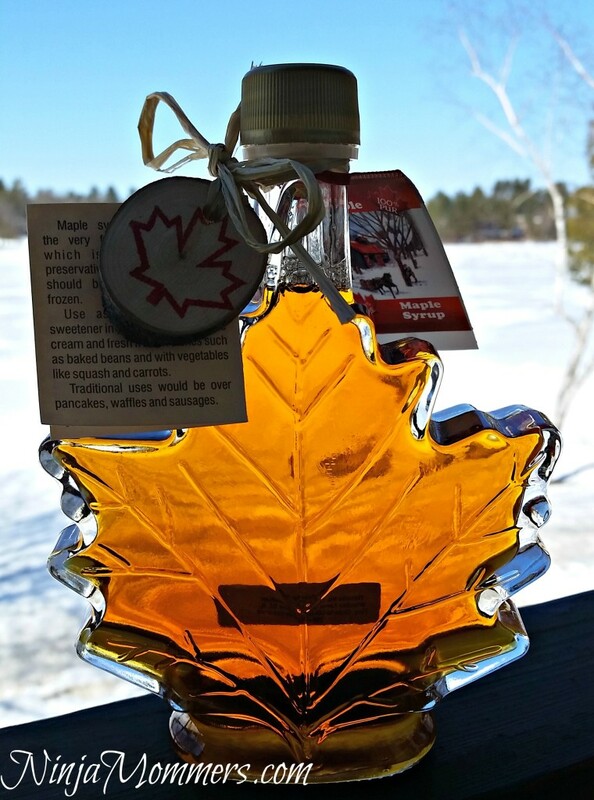 Have you Visited a Maple Syrup Bush yet this year?